James Cavender died on May 29, the company confirmed Tuesday. The founder of Cavender's, the western wear retail chain based in Tyler, Texas, has passed away. James Cavender died on May 29, according to Facebook business page RattayCavender. He was 87 years old. Jennifer Green, the public relations manager for Cavender's, confirmed his passing. Cavender was a member of First Baptist Church in Pittsburg, Texas and served in the United States Air Force. He was the founder and CEO of Cavender’s, a major Texas based western wear retail chain that now has stores in 11 states. He was known for his incredible work ethic, disposition and joy when helping customers. He was fortunate to attract many loyal associates over the last 53 years; many have been with the company for 30 or more years, according to a press release. 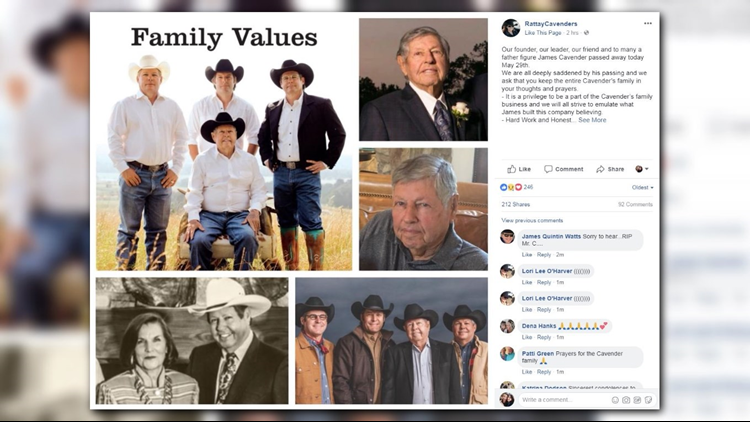 "We are all deeply saddened by his passing, and we ask that you keep the entire Cavender's family in your thoughts in prayers," the RattayCavender Facebook post read. The Cavender's brand was started in 1965 and currently consists of over 70 stores throughout the south, including 48 "Cavender's Boot City" in Texas. Cavender, an only child, is preceded in death by his parents Lois Otis “L.O.” Cavender and Loyce Estelle Stewart. He was married to his wife Patricia Ann Whitten Cavender for 63 years. They have four children, Joe Mark Cavender and wife Nancy; Mike Alan Cavender; Traci Ann Cavender and Clay Courtney Cavender and wife Jacqueline. James Cavender is also survived by his grandchildren, Whitney Cavender Edwards and husband Todd; Morgan Cavender; McClain Cavender Devine and husband Andrew; Drew Cavender and wife Kayla; Cooper Cavender; Colton Cavender, Conley Cavender and Cline Cavender. Great-grandchildren include Knox Edwards, Kingston Edwards and Wyatt Devine. A memorial service will be held on Friday, June 1 at 3 p.m. at the First Baptist Church in Pittsburg, Texas. Visitation with the family will be held at First Baptist Church Family Life Center in Pittsburg, Texas on Thursday, May 31 from 5 to 7 p.m.